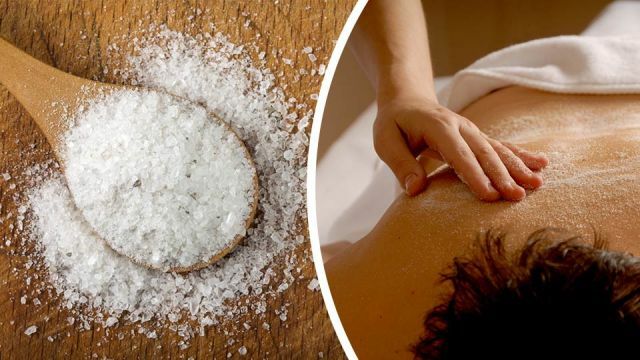 You’ve likely heard of Epsom salts; a folk remedy used for generations to heal muscular aches and pains. Well, Epsom salt actually does have a long history of varied uses and benefits for everything from health and beauty to household cleaning and gardening. But while there may not be a lot of clinical trials to support health claims, many people swear by this remedy. So, why not try an Epsom salt bath yourself, as a natural way to relieve pain, de-stress and even soften your skin. For those who believe Epsom salt is sodium, it’s not. It’s actually crystals of hydrated magnesium sulfate. Named for a bitter saline spring at Epsom in Surrey, England, it’s a pure mineral compound, well known as a natural remedy for a number of ailments. Keep in mind, there are different “grades” of Epsom salt for different uses, such as for humans or agricultural use. According to the Epsom Salt Council only packages labeled “USP” and those which contain “drug facts” are safe for human use. This verifies that these salts are manufactured, tested and certified to meet the Food and Drug Administration (FDA) and the United States Pharmacopeia (USP) stringent regulatory standards. It’s important to find healthy ways to manage your stress, and Epsom salt baths are a simple way to do that. Stress drains the body of magnesium, and since many of us experience chronic stress, our bodies become magnesium deficient. Research in the Journal of American College of Nutrition suggests that when magnesium deficiency exists, stress can lead to an increased risk of cardiovascular disease and even sudden death. However, according to certain studies when Epsom salt is dissolved in warm water, magnesium is absorbed through the skin. This helps replenish magnesium levels in the body, which in turn, helps promote a feeling of calm and relaxation. Simply add two cups of Epsom salt and half a cup of olive oil into warm bathwater. Soak for 15 minutes. Soothe and soften rough skin on your feet prior to a home pedicure. Just add one cup of Epsom salts to a footbath and soak for 10 minutes to soften rough feet. An Epsom salt foot bath can also help eliminate foot odor. An Epsom salt bath is said to be a tried and true remedy for sore and aching muscles. Once again, the reason is magnesium. Magnesium is an important electrolyte for human metabolism. In fact, about 99 percent of total body magnesium is located in bone, muscles and non-muscular soft tissue according to a study published in the journal Nutrients. In water, Epsom salts break down into magnesium and sulfate. And, the thought is that when you soak in a warm bath with Epsom salts, magnesium gets into your body via your skin — relaxing sore joints and muscles. Simply dissolve about one to two cups of Epsom salts into a hot bath. Pour the salts under running water as you fill your bath to allow the salts to dissolve. A soothing bath before bed will also improve sleep. Gout once thought to be “a rich man’s disease,” is the result of the build-up of uric acid in joints, particularly in the feet and big toe. And, anyone who has experienced gout knows that the pain can be excruciating. Reduce inflammation associated with gout by adding two to three teaspoons of Epsom salts into a basin filled with hot water. Immerse the affected joint, and soak for 30 minutes. Rough, dry and patchy skin needs to be exfoliated regularly to remove the buildup of dead skin cells. Epsom salts are ideal for exfoliating. Mix about a half cup of Epsom salt with a half cup of coconut oil, olive oil or your favorite body wash. Simply rub it on your skin in the shower and rinse off. Add two cups of Epsom salt to warm bath water, under a running spout. Never warm bathwater above 102 degrees Fahrenheit. Soak in the bath for at least 12 minutes. Water should feel soapy to the touch. For relaxing aromatherapy benefits, add lavender essential oil to the bath water. Ingrown toenails dig into the skin, causing irritation and pain. A red, swollen, hot and very painful ingrown toenail is likely infected. For ingrown toenail relief, soak the foot in an Epsom salt bath to ease inflammation and pain. Follow with an antibiotic ointment and bandage to the area says the Cleveland Clinic. Constipation occurs when your stool takes too long to move through your digestive tract and then becomes hard and dry. This can lead to fewer bowel movements or none at all. The Mayo Clinic suggests that constipation occurs if you have bowel movements less than three times per week — or less than what’s considered normal for you. Taking an Epsom salt bath may relax your gut and help soften your stool, thanks to the magnesium absorbed through your skin. The therapeutic benefits of Epsom salt have been known for generations. So, the next time you have a bath, why not throw in a cup or two of Epsom salts? It’s a great way to unwind and an easy way to replenish your body of much-needed magnesium. Hey Buddy!, I found this information for you: "Flush Toxins + 7 Other Health Benefits Of Epsom Salts". Here is the website link: https://www.thealternativedaily.com/8-health-benefits-of-epsom-salts/. Thank you.